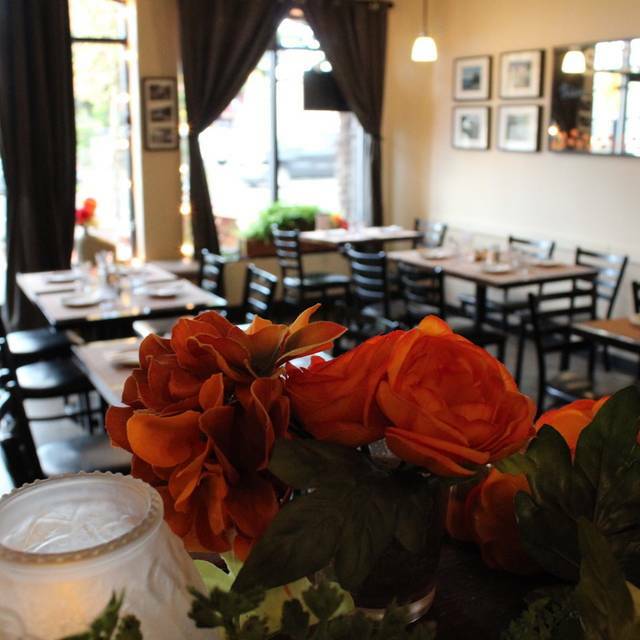 Bergerac can host both private and corporate events in our cozy and intimate space. Seating up to 32 for dinner or 50 standing we can create a bespoke menu for your special occasion. An authentic French menu with recipes inspired by Southwest France and the comfort of home cooking. 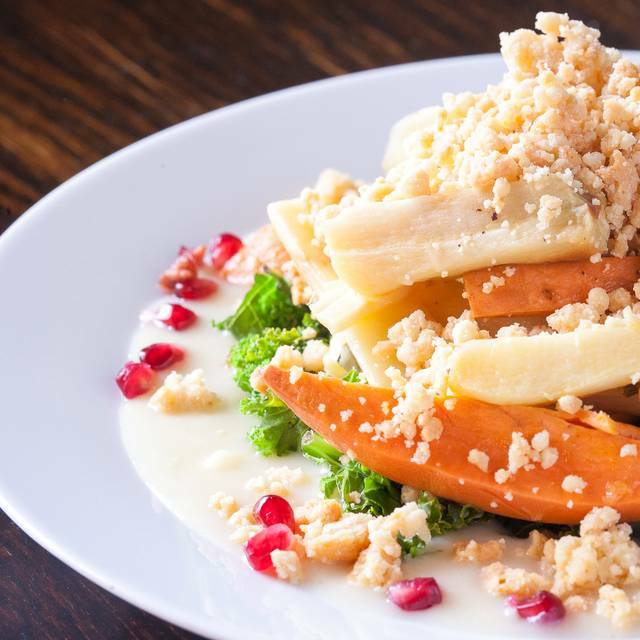 Our menu is created using fresh ingredients, local where possible and always cooked to order. Choose appetizers such as Escargots or homemade pâté or our goats cheese and beetroot salad. Joris is the head chef and co-owner with his wife Gisella and comes from Bergerac in France. Join us for a French Easter Brunch and seasonal cocktails. I look forward to dining @ Bergerac again, even though it's somewhat out of the way for me. 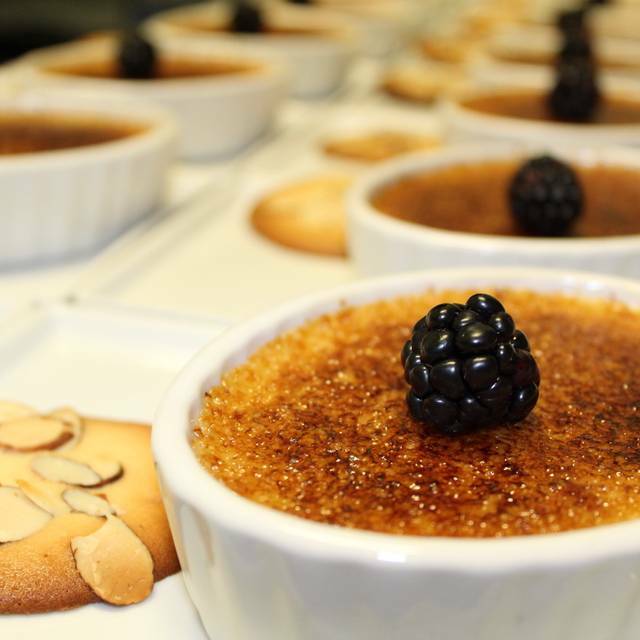 Cozy atmosphere, friendly knowledgeable service and a well- selected menu of classic French dishes with just enough variety to have something for everyone. Limited, but high quality wine list with reasonable prices. The share platter of appetizers plus soup could’ve easily served as a light dinner. A lovely neighborhood spot! This is a great little neighborhood restaurant where they clearly care about lovingly creating good food and not about being a trendy spot. So refreshing in so many ways. I will definitely return! Great brunch spot. Omelet, Quiche, and Eggs Benedict were all perfect. Great authentic French food. Made me fondly remember eating in France at small neighborhood or village restaurants. The servers were friendly and helpful, and the prices were quite good for the quality of the food. I would definitely go here again, even though it's a bit off the beaten track in Portland. I think the wine pours should be 6 to 8 ounces. They were about 4 or less. This restaurant has a feeling of authenticity, returning us to the innumerable no-name places we seek out while traveling in France. It is comfort food and homey atmosphere to the max. It isn't a special-occasion, knock-your-sox off place, either in food or ambiance but can always be counted on to provide a satisfying supper and environment to catch up with friends and family. Wines, while limited, are well chosen. Excellent and patient service by our waitperson. Thoughtful suggestions about the wine, the appetizers and the main courses. I was there to catch up with a friend and Bergerac was the perfect site for a slowly enjoyed dinner and a long conversation. It felt like dining in someone's home. Out standing food and service. Small restaurant feels cozy and reminds me of the local restaurants in France. I really like this place and you will not be disappointed. Its all good try something different. Food is excellent, service is hit or miss - "enthusiasm" is not service its attitude. Service is getting the order right, delivering the food hot from kitchen (to the correct table), paying attention to the client's needs and requests. 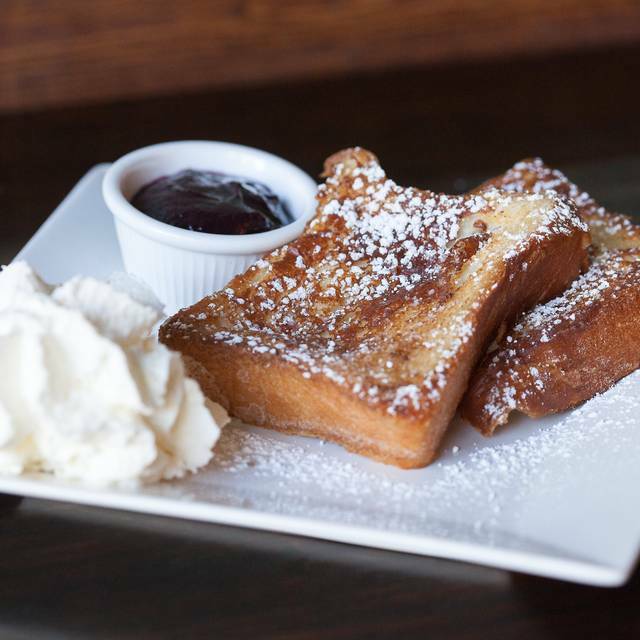 We like the neighborhood quality of the place and find the food a pleasure; we return for that inspite of the ill-trained wait staff. This place has good food and good service. A nice French menu, without extravagant prices. When full, it can be fairly noisy. And it's a neighborhood gem to boot. We loved this place! The food was amazing! The atmosphere was quiet and comfortable. Great meal, cozy atmosphere. Nice selection of food and great wine list. Very reasonably priced. French vibe with outstanding service! Definitely coming back. I was disappointed in our dinner. I had been here a couple of years ago and was very pleased. This time, with friends from out of town, our meals really weren't very good. I ordered duck, it didn't have much flavor. Another person ordered lamb, said it was tough and cold. The desserts were good though! Exquisite food and very reasonable prices....you don’t want to miss a chance to eat here. We’ll be back. Great bistro. Maybe the best lamb in ages. Give it a try. Nice home made pate as well. I had the pot au chocolat for dessert — I’ll be dreaming about that one for days to come. The intensely rich chocolate flavor was the perfect cap to a great meal. This place is a hidden gem! Very good food at reasonable prices. Laid-back atmosphere. The food is amazing. The service is great. It's a little cafe, so expect small cafe seating, but it's not loud and there is still a feeling of intimacy, as you don't really hear other folks talking. Should be a 5 for anyone dining here. Emily a great server. Outstanding ambiance, friendly service, super food. Value for price. Book now! Bergerac is a little local gem. 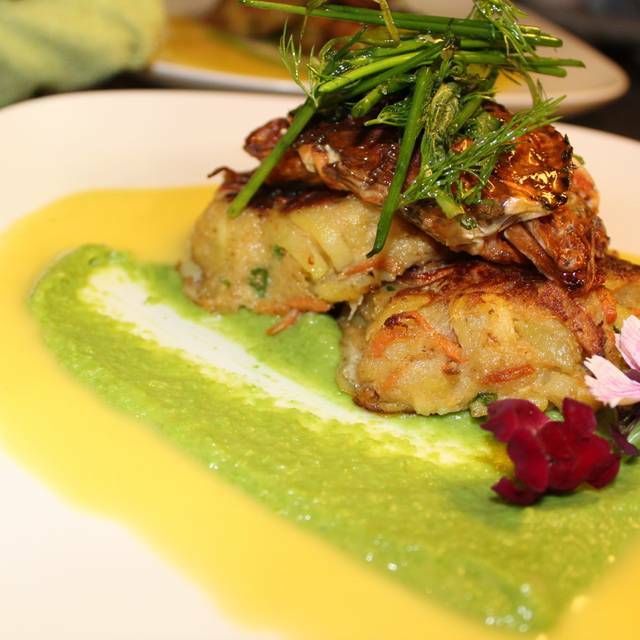 A delicious, romantic, authentic, quality... all around fantastic dining experience. The escargot was to die for. Highly recommend!! We were so disappointed. After several very positive experiences at Bergerac, tonight’s dinner was generally not good. It’s not a good feeling to leave dinner either hungry or with a bad taste in your mouth. That happened to us. Our waiter was either inexperienced or just inattentive. We started with the cheese board, which offered very tiny sampling’s of 3 cheeses, a few slices of apple, lovely onion jam and toasted sunflower seeds. We ran out of bread/ crostini and apple, and would have loved to have more crostini or bread, but our waiter never checked on us. 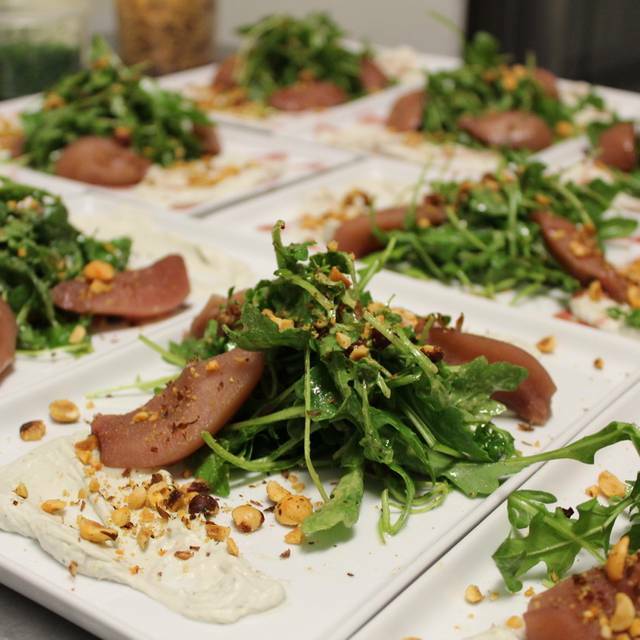 The arugula pear salad was the bright spot of the meal: poached pear and arugula in a tasty dressing, topped with chopped hazelnuts. Here’s where things went south. Our entrees arrived so over cooked that they were barely edible. My partner got the lamb. It tasted very “gamely” because it was so over cooked, the accompanying green beans also slimy and limp. The gratin dauphinois were edible, but basically mashed potatoes with cheese. My entree, the fish of the day, was sea bass. It was basically inedible, mostly due to being Kept in some kind of warming oven for who knows how many hours? The thin piece of bass was topped with the skin, which, if crispy, would have been an added element to the fish. Due to being extremely over cooked, the crispy skin was rubbery, and had to be taken off. The sea bass below was mushy. It sat on a bed of mashed split peas, which matched the texture of the fish. I tried but could not eat it. The fish was surrounded by bitter cooked radishes, unrecognizable asparagus that was sliced lengthwise, stringy and over cooked, sliced baby carrots that were not tender ( how did that happen with all the over cooking?) citrus slices and sauce. It was a mushy mess that was mostly left on the plate. Our waiter never checked to see how our dinners were. We left with no desire to return. I checked out Bergerac for the Valentine's Day pre-fixed menu and it was such a wonderful experience. We have zero complaints. The service was amazing, the ambiance was so perfect for a romantic meal with my boyfriend and I loved the food. The cocktails were pretty out of this world as well. Excellent gem in Southeast Portland! A bit of France on Woodstock! A sweet little neighborhood bistro. It isn’t fancy but dear and warms the soul. 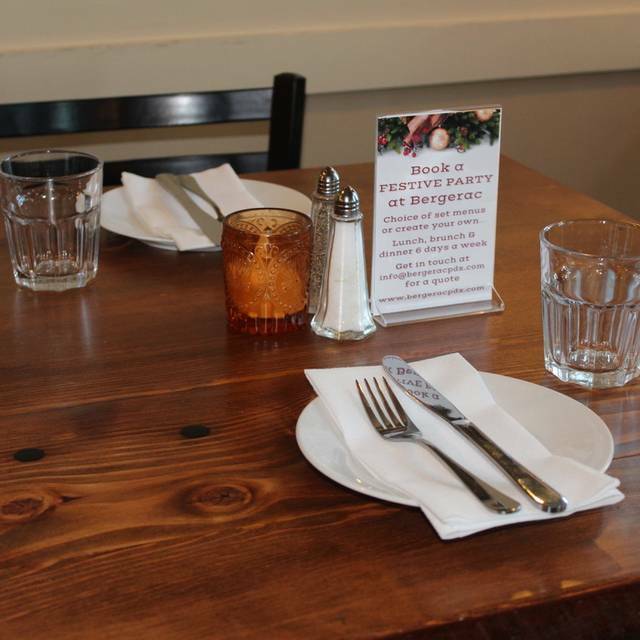 Intimate setting for a small group, couple or even a lunch meeting. Also a nice sized brunch menu. Both our main courses (canard and steak) were excellent. Better duck confit than I have had almost anywhere. Authentic French food with home feel. Beautiful dining room. Quaint. Server attentive and welcoming. Food delicious in every aspect. First time visit and will return. Have already recommended it to others. We found the cassoulet aggressively salted to the point of being the only thing we could taste. 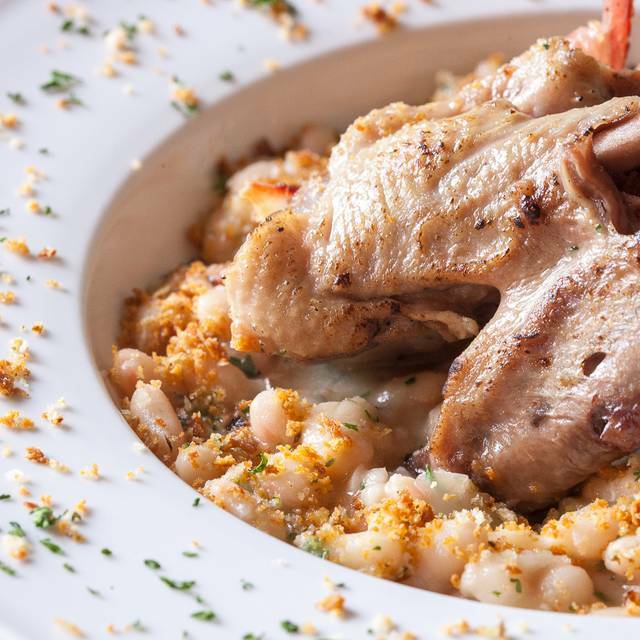 I have had cassoulet many times and never have I found it too salty. The fish special was bland, and the appetizer was rather expensive for what we received. We did enjoy the pear tart. Although the establishment gets generally positive reviews, there is s healthy minority complaining of issues with seasoning. I hope the owners pay attention. This is French eating at it’s best - interesting taste combinations without being frou-frou. Honest regional dishes from Bergerac, France that delighted us (my husband is from Paris). The four of us kept making, ‘Mmmmmmm’, ‘Oh man!’, ‘Yum!’ kind of noises as we ate our way into food eactasy! 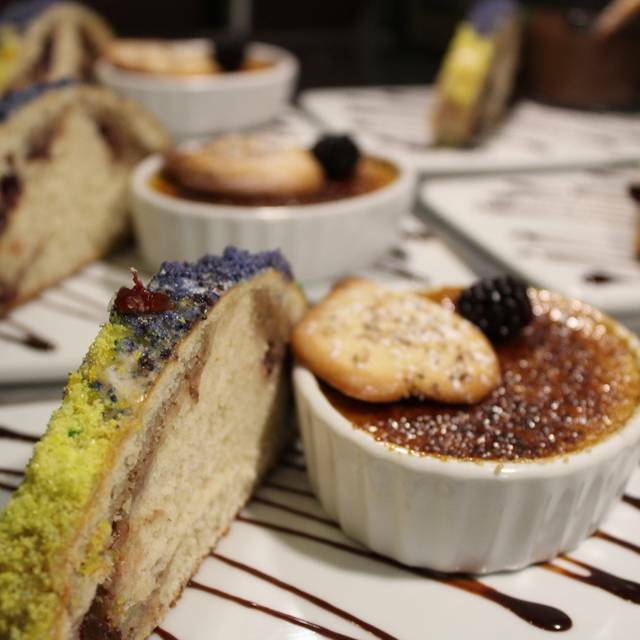 We will definitely be returning, if not just for the desserts - yes, dessert after breakfast! As a French native I can say the food is really authentic. Good taste, good atmosphere. I enjoy going there and have never been disappointed so far. Probably the best find in this neighborhood. Try the specials! Very good, very French food with cheerful, prompt service. Tables are quite close together. This place blew us away. I’m certain there isn’t anything on the menu that won’t be a dish to remember. Our waitress was engaging, funny and had excellent timing. The food made us want a second helping though we were stuffed. We would actually drive down to Portland just to host a party or celebrate something special at this place. Amazing.